Snaggle Nose appears to have come through the winter quite well. It seems he is boasting at least 500lbs of weight. He hung around the old ruins camp for about 6 hours and they got quite a few pictures of him. He is in no mood to move fast and doesn't feel at all threatened by much in the woods including people. 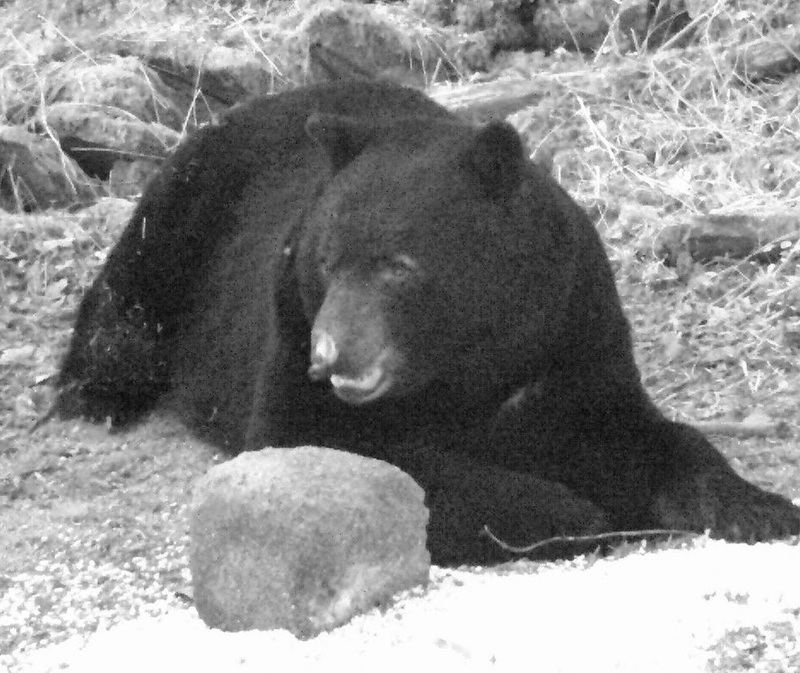 Last year we noticed the other bears ran off when he showed up and he is even bigger now. Even with half his nose bit off he is still a formidable opponent for any other bear male. It couldn't have been a more perfect weekend with temperatures in the mid 60's the first weekend of trout season was pleasant for all. It gave me some time to take a walk and check out the pond in back full of water from the melt off. The woods however, is quite dry and it was windy enough there were grass fire warnings. All week in town the sirens have been blowing chasing one small fire after another. It don't take long for the wind to whip a small fire out of control. We are glad to have made it through a hard Leetonia winter and happier than most to see Springs and the warm weather. Lee and I got the screens up on the front porch to keep the barn swallows from building nest and the bugs to a minimum while we sit on the porch glider and enjoy the songs of birds once again enjoying the mountains of Leetonia. Mountain girl, Paula, logging out. 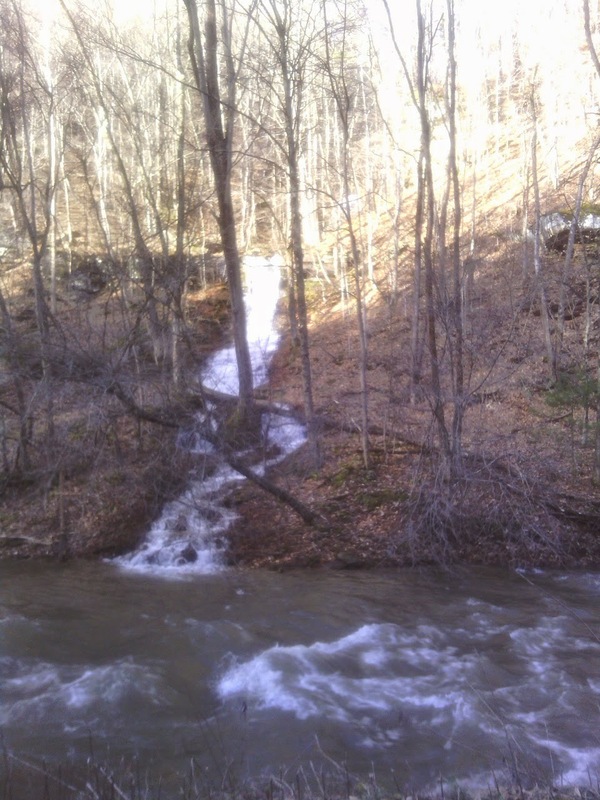 Water Fall along Leetonia Rd. I traveled up from Cedar Run tonight in 2-wheel drive. If you have a car you love and would be upset if it hit a pothole or got muddy don't come up yet. Otherwise it is quite drive able. This time of year you have to watch out for rocks falling as the weather warms and the rain comes down. 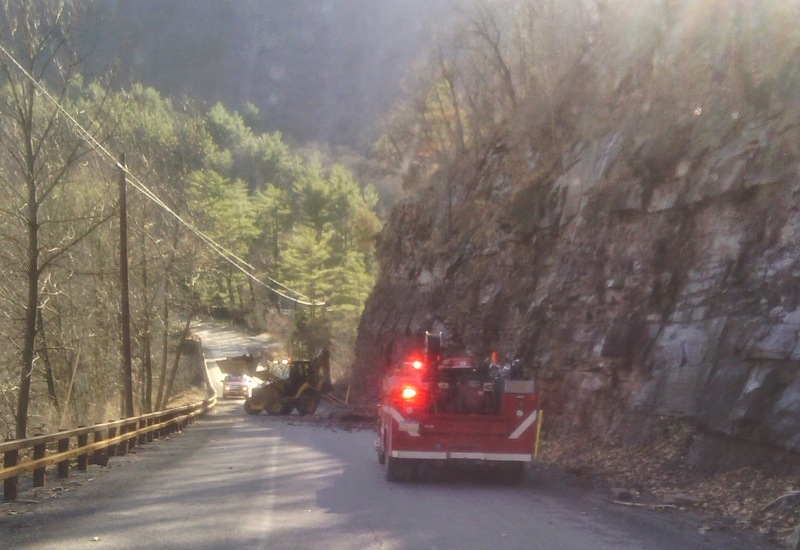 The second picture shows them clearing the road near the Cedar Run Creek Bridge on 414. I had to wait a bit before I could get by. The rocks as large as the ones they are moving could kill more than your car. The smaller rocks are sharp and play whack a mole on your tires. The combination of the rain and snow melt has popped Pine Creek up over 6 foot a few times and it is still running high for the skilled boat person this is the time they love. I myself like it from 2-4 feet 6 sort of scares me. The sound of the creeks rushing and the beautiful falls this time a year makes the drive up the back roads worth the torture to your vehicle. This weekend I am opening up one of the camps and praying that the well will start as our ground frost is still pretty deep. Next weekend is the opening to trout season so many a Leetonia Fisherman will be stalking the streams. The weather is supposed to be in the 60's over the weekend and I am loving that. Mountain girl, Paula, logging out. Just an update on Leetonia Rd. coming up from Cedar Run. The road is 75% melted. The stretches that are ice run 1/4 to 1/2 mile long. The two sections of narrow road right before Leetonia is one of those. I came up without chains as it was raining and warm. I traveled slow in four-wheel drive through the icy sections and was fine. However during times the temperatures drop below freezing these areas could become very slick and hazardous. On a mountain girl scale of 1-10(10 being forget it, 1 being flat-lander safe) today with above freezing weather. I give it a four. I still recommend having chains with you for weather changes and four-wheel drive is the best. From Leetonia up to our place it is icy under the trees to Micks old place. Then the last mile to our house is the deepest of all the slush ice anywhere. After our place you are home free if you stay on Leetonia Rd. Just remember sides of the mountain the sun don't hit are still going to have ice and snow. Tuesday we got 5 inches of snow. I didn't want to post anymore snow pictures so look at the last two posts if you want to remember what snow looks like. Most of that snow melted in the 55 degree weather today up top and the 65 degree day in Wellsboro. Mountain girl, Paula, logging out and hoping Spring comes and stays.